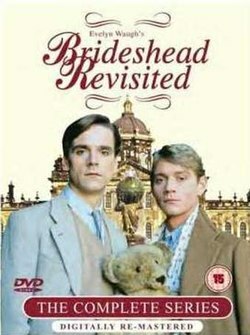 Brideshead Revisited is a 1981 British television serial starring Jeremy Irons and Anthony Andrews. It was produced by Granada Television for broadcast by the ITV network. Most of the serial was directed by Charles Sturridge; a few sequences were directed by Michael Lindsay-Hogg. The serial is an adaptation of the novel Brideshead Revisited (1945) by Evelyn Waugh. It follows, from the 1920s to the early 1940s, the life and romances of the protagonist Charles Ryder—including his friendship with the Flytes, a family of wealthy English Catholics who live in a palatial mansion called Brideshead Castle. The screenplay was written by Derek Granger (the film's producer) and others. Although the film credits attribute the screenplay to John Mortimer, Mortimer's script was not used. The 11-episode serial premiered on ITV in the UK on 12 October 1981; on CBC Television in Canada on 19 October 1981; and as part of the Great Performances series on PBS in the United States on 18 January 1982. In 2000, the serial was tenth on the list of the 100 Greatest British Television Programmes compiled by the British Film Institute, based on a poll of industry professionals. In 2007, the serial was listed as one of Time magazine's "100 Best TV Shows of All-Time". In 2010, it was second in The Guardian newspaper's list of the top 50 TV dramas of all time. In 2015, The Telegraph listed it as #1 in the greatest television adaptations, stating that "Brideshead Revisited is television’s greatest literary adaptation, bar none. It's utterly faithful to Evelyn Waugh's novel yet it's somehow more than that, too." In the spring of 1943, disillusioned Army captain Charles Ryder is moving his company to a new Brigade Headquarters at a secret location he discovers is Brideshead, once home to the Marchmain family and the scene of both pleasant and anguished visits for the younger Charles. Seeing the house for the first time in several years prompts a recollection of Charles' first meeting with Lord Sebastian Flyte, the Marchmains' younger son, at Oxford University in 1922, and the rest of the narrative flashes back to that time forward. At Oxford, two young men quickly bond and, although his cousin warns him to avoid Sebastian and his inner circle of friends, Charles is fascinated by them, particularly the flamboyant and openly gay aesthete Anthony Blanche. Short on funds, Charles finds himself fitfully spending the summer holidays in London with his indifferent and rigid father Edward until an urgent message from Sebastian sends him to Brideshead, where Charles is introduced to a world of wealth and privilege dominated by a powerful devotion to Catholicism. At Brideshead, Charles is introduced to Sebastian's younger sisters Julia and Cordelia and his older brother Brideshead ('Bridey'). The two young men decide to accept an invitation to Venice extended by Sebastian's father, Lord Marchmain, who lives there with his mistress Cara. Back at Oxford, Sebastian learns his mother has arranged for him to be tutored - and carefully supervised - by Mr. Samgrass. Lady Marchmain visits the university and implores Charles to be a good influence on her rowdy son. Invited to a charity ball in London by Julia, Charles and Sebastian escape to a seedy nightclub in Soho. After a drunken Sebastian crashes their car, the political and social power of ambitious MP Rex Mottram and Mr. Samgrass result in Sebastian being let off with only a fine. Sebastian's rapid descent into alcoholism leads him into constant trouble, despite the ever-watchful eye of Mr. Samgrass. During Easter holiday at Brideshead, Charles tries to reason with a constantly inebriated Sebastian, who accuses him of being a spy for Lady Marchmain. Sebastian's failure to reform leads to his dismissal from Oxford, and a bereft Charles returns to London to ask his father permission to leave the university in order to study art abroad. Charles returns from his art studies in Paris and journeys to Brideshead for the 1925 New Year's celebration. Sebastian has returned from an excursion to the Levant with Mr. Samgrass, but photographs of the holiday and comments made by the two clearly indicate Sebastian frequently went off on his own to satisfy his hedonistic needs. Sebastian agrees to participate in a fox hunt although he plans to make an early escape to a pub, so he asks Charles for money and his friend acquiesces. When Sebastian returns home heavily inebriated at the end of the day, a distressed Lady Marchmain questions Charles. Learning he financed Sebastian's drinking binge, she rebukes him for enabling him, and Charles leaves Brideshead, fully expecting never to return. Charles returns to Paris, where he is visited by Rex Mottram, who is searching for Sebastian and the money he stole before he disappeared. Rex discusses the financial woes of the Marchmain family and announces he intends to marry Julia nonetheless. Lady Marchmain reluctantly consents to the marriage as long as Rex converts to Catholicism, a condition he is willing to accept. But when Bridey learns Rex has a former wife who is living, a situation the Church will not abide, he cancels the wedding, and a defiant Julia marries Rex in a Protestant ceremony her family, with the exception of Cordelia, refuses to attend. In May 1926, Charles returns to England to volunteer his services during the General Strike. While delivering milk in the East End, he encounters Boy Mulcaster. At a party they encounter Anthony Blanche who tells how Sebastian is living in Fez. Julia tells Charles her dying mother is anxious to make amends with her prodigal son, and he agrees to go to Morocco and bring him home. He discovers Sebastian has been living with Kurt, a German ex-soldier discharged from the French Foreign Legion after deliberately shooting himself in the foot. Sebastian is a chronic alcoholic and has been hospitalized with pneumonia. Charles finds his friend emaciated and dissipated, unwilling to follow doctor's orders, and disinclined to leave Kurt alone. Before Charles departs Morocco, he learns Lady Marchmain has died. Bridey commissions Charles to paint four scenes of Marchmain House in London, which has been sold to rectify Lord Marchmain's financial difficulties, before it is demolished to make way for a block of flats. He is reunited with Cordelia, who regrets the ongoing dissolution of her family but assures Charles she continues to find strength in her faith. Cordelia recalls her mother’s reading of a Father Brown story where G. K. Chesterton’s priest catches a thief "with an unseen hook and an invisible line which is long enough to let him wander to the ends of the world and still to bring him back with a twitch upon the thread". Time passes and Charles spends two years in Mexico and Central America painting, then has an awkward reunion with his wife Celia in New York City before the two sail home. On board ship, the two discover Julia is a fellow passenger. Celia is bedridden with chronic seasickness prompted by extremely rough seas, leaving Charles and Julia to become reacquainted, and the two become lovers before reaching Southampton. Back in London, at an exhibition of her husband's latest artwork, Celia implies she knows about his affair with Julia. Anthony Blanche arrives at the gallery late and invites Charles to join him for a drink in a seedy gay bar, where he criticizes his talent and paintings, and informs Charles that his affair with Lady Julia is already widely rumored. Charles and Julia depart for Brideshead, where Rex is awaiting his wife. Charles and Julia, awaiting their respective divorces, live together, unmarried, at Brideshead. When Bridey announces his engagement, Julia suggests he invite his fiancée to Brideshead. Bridey points out that a highly moral and staunchly Catholic woman with middle-class values would never sleep under the same roof as a couple "living in sin". Bridey's comments stir extraordinary feelings of remorse and pain in Julia, revealing her long-standing Catholic guilt to Charles. Cordelia returns from ministering to the wounded in the Spanish Civil War with disturbing news about Sebastian's nomadic existence and steady decline over the past few years. She predicts he will die soon in the Tunisian monastery he has taken shelter in as his alcoholism consumes him. In 1939, World War II is imminent. After years of self-imposed exile in Venice, the terminally ill Lord Marchmain decides to return home to die. Appalled by Bridey's choice of a wife, he announces he plans to leave Brideshead to Julia and Charles. When Bridey brings a priest to visit his very weak father and perform the last rites, Charles objects vocally, and offends Julia by harping on the question of what the sacrament actually accomplishes and what rationale there could be for performing it, especially knowing Marchmain's aversion to Catholicism. Lord Marchmain sends the priest away, then meets with his lawyers to change his will. But as Lord Marchmain weakens to the point of semi-consciousness, he finally accepts by making the sign of the Cross the absolution conditionally pronounced by the priest. Tearfully, Julia calls off her marriage to Charles, because she does not wish "to set up a rival good to God’s". She explains to him "that if I give up this one thing I want so much, however bad I am, He won't quite despair of me in the end". Charles, who has been moved by Lord Marchmain's final re-conversion, understands, but it breaks his heart, too. The narrative returns to Brideshead in 1944. Charles, now a believer, visits and prays in the reopened chapel, which has been closed since Lady Marchmain's death in 1926. A twitch upon the thread has brought him to the Faith. The sanctuary lamp, its symbol, burns anew. The television adaptation of Waugh's novel was originally conceived as a six-hour serial. In the summer of 1979, director Lindsay-Hogg began principal photography on the island of Gozo, where the sequences set in Morocco, Mexico and Central America were filmed. Shortly after the cast and crew returned to England, a technician's strike brought all ITV production to a halt. By the time it was settled four months later, Lindsay-Hogg was no longer available due to a prior commitment to another project. Lindsay-Hogg was replaced by relative novice Charles Sturridge, whose previous experience had been limited to directing episodes of Strangers and Crown Court. Cast contracts had to be renegotiated to take into account the extended filming period. Jeremy Irons, who was planning to audition for the film The French Lieutenant's Woman (1981), stipulated he would remain with Brideshead under condition he would be allowed time off to film French Lieutenant if he were cast. Rather than scrap the considerable completed footage in which the actor appeared, Granger agreed. Castle Howard in North Yorkshire was used as Brideshead in the miniseries. The break in filming was fortunate in that Castle Howard and Laurence Olivier, both previously unavailable, could now be used in the serial. Sturridge and Granger agreed the six-hour script eliminated enough detail of Waugh's story that its potency was compromised, and they set about expanding it to seven two-hour episodes. The decision was also made to have the protagonist Charles Ryder narrate the serial as he had in the novel. Olivier's tight schedule required he start immediately, but his scenes had not yet been written, and Sturridge and Granger hurried to complete them so the actor would have at least a week to learn his dialogue. Mona Washbourne was less fortunate and received her script the day she arrived on the set to begin filming. Shooting resumed on 5 November 1979. The week was divided into five days of filming and two days of writing. Sturridge and Granger were anxious to complete the teleplay as soon as possible, and by the time the ten-day break for Christmas ended, the script was finished. Granada Television had approved a larger budget for the extended format, and Sturridge scheduled the shooting of sequences in Venice, London and on board the RMS Queen Elizabeth 2. Everything was going according to plan, and then Irons was cast in French Lieutenant. Since his character is in nearly every scene of the serial, Sturridge was forced to place Brideshead on a lengthy hiatus. During this period, he edited completed scenes and continued to hone the script, although ultimately John Mortimer received sole screen credit for it. Filming resumed in September 1980. Because French Lieutenant had fallen behind schedule, Irons was forced to work on both projects simultaneously. The Oxford scenes were filmed largely at Waugh's alma mater, Hertford College, and the rooms Charles occupies in the film were those in which Waugh lived after his second term. Portions of Wadham College and Christ Church were also used. Most of the grounds, all the major public rooms, and several rooms in the private wings of Castle Howard represented Brideshead. Bridgewater House in Westminster was used for the exterior of Marchmain House, and its interiors were filmed in Tatton Hall. Rex and Julia's wedding was filmed in the chapel at Lyme Park. Venice locations included the Basilica di Santa Maria Gloriosa dei Frari, the Scuola di San Rocco, and the Palazzi Barbaro. The ocean-liner deck scenes were filmed on the QE2 during an actual storm, but the ship's interiors were either sets or public rooms in the Adelphi Hotel in Liverpool and the Park Lane Hotel in London. The riot in the General Strike sequence was the last scene to be filmed, and principal photography was completed in January 1981 after forty-two weeks of filming. Post-production was scheduled for the next seven months. Early into the period, ITV decided two-hour episodes were too lengthy, and Sturridge was forced to restructure the entire serial, beginning and ending it with expanded episodes that would bookend nine episodes running slightly less than an hour each. ^ Jones, Alice. "Life after Brideshead". The Independent. 1 October 2008. ^ Erickson, Hal. "Brideshead Revisited – Synopsis". AllMovie. Retrieved on 21 May 2016. ^ Poniewozik, James (6 September 2007). "The 100 Best TV Shows of All-Time". TIME. Retrieved 4 March 2010. ^ Dempster, Sarah; Dent, Grace; Mangan, Lucy; Lawson, Mark; Wollaston, Sam; Vine, Richard (12 January 2010). "The top 50 TV dramas of all time: 2-10". The Guardian. ^ a b c d e Sturridge, Charles. The Making of Brideshead: A Note from the Director. Included in A Companion Guide to Brideshead Revisited in the Acorn Media UK DVD released 25 June 2002. ^ Filming Locations. Included in A Companion Guide to Brideshead Revisited in the Acorn Media UK DVD released 25 June 2002. ^ "BPG TV & Radio Awards: 1982". BroadcastingPressGuild.org. Broadcasting Press Guild. 2007-12-31. Retrieved 2017-05-13. ^ "Television: Drama Series or Serial in 1982". BAFTA Awards Database. British Academy of Film and Television Arts. Retrieved 2017-05-07. ^ "Television Craft: Original Television Music in 1982". BAFTA Awards Database. British Academy of Film and Television Arts. Retrieved 2017-05-07. ^ "Television Craft: Costume Design in 1982". BAFTA Awards Database. British Academy of Film and Television Arts. Retrieved 2017-05-07. ^ "Television Craft: Film Cameraman in 1982". BAFTA Awards Database. British Academy of Film and Television Arts. Retrieved 2017-05-07. ^ "Television Craft: Film Editor in 1982". BAFTA Awards Database. British Academy of Film and Television Arts. Retrieved 2017-05-07. ^ "Television Craft: Film Sound in 1982". BAFTA Awards Database. British Academy of Film and Television Arts. Retrieved 2017-05-07. ^ a b c "Winners & Nominees: Brideshead Revisited". GoldenGlobes.com. The Hollywood Foreign Press Association. Retrieved 2017-05-07. "Brideshead Revisited". Encyclopedia of Television. Museum of Broadcast Communications. Angelini, Sergio. "Brideshead Revisited". Screenonline. British Film Institute. Cliffe, David. "A Companion to Brideshead Revisited". An Evelyn Waugh Website. David Cliffe. Archived from the original on 30 July 2016. Foden, Giles (21 May 2004). "Waugh versus Hollywood". The Guardian. Guardian News and Media.